Enwrap is a mixed media hung artwork created by loom weaver Susie Gillespie. Inspired by early weaving techniques, Susie creates textiles that represent ancient cloth. 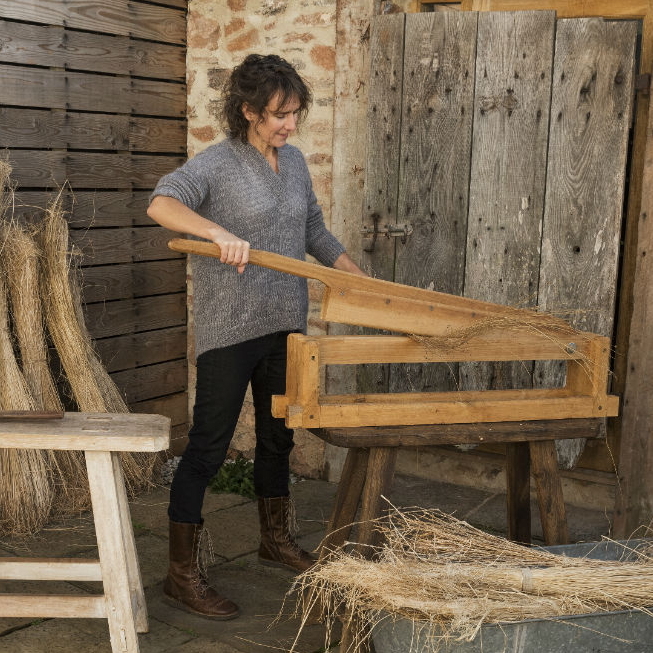 To achieve this finish, she collects and spins local plant fibres, before weaving them and working the final cloth with plaster, gesso, pigments, indigo and tannin. This aged patina breaks down the fibre, which Susie mends and repairs, adding to its aged quality. Material: Mixed Media Dimensions: Height 500mm, Length: 700mm, Width: 50mm Care Instructions: Very occasional light vacuuming. Susie Gillespie is a hand-weaver producing textile art in South Devon. A fascination for historic textiles and the methods used to produce them informs her work – which incorporates antique linen yarns, nettles and home-grown flax. Susie does every step of the creation process herself, from growing, processing, spinning yarn right through to weaving. Her use of natural materials, combined with her techniques produce pieces that are full of texture and life- qualities visibly lacking in machine spun fabrics.